Since last night we have been motor sailing, a combination of using the sails for stability and some drive, and using the engine to keep the speed up and provide continual thrust through the waves. Our rough rule is to motor when we cannot do three knots or more for an hour, or if the waves and winds make the passage uncomfortable. Or at least more uncomfortable. Since we are motoring and fairly swim in power, we keep the radar on all the time, luxuriating with our third eye. About every fifteen minutes we visually check all around, check the chart plotter for any new AIS or radar targets, and keep a close eye on current targets. So far we had a cruise ship last night and a town on shore. Watch out for those little towns, they can be deceptive in the dark. We turned off the engine mid day when the winds picked up to about five knots. With the silence, the swell is hypnotic. The water is a deep, beautiful blue, and the light winds ripple the surface of the slowly undulating waves, like a gentle breeze ruffling wheat in a field, mesmerizing like a fire. But this field is in motion, rising one or two meters, then falling the same amount, thankfully, about every fifteen seconds. The swell is always moving towards you, or away, depending upon the position of the dogs and your subsequent compromised perch. Damn dogs, always under knee when trying to crank a winch or grab the trail mix. We love 'em so. As the sun went down, our wind dropped from around ten knots this afternoon to between four and five, now around ten at night. The boat is moving between two and three knots, and it is pleasant sailing indeed. Slow to be sure, and not as exciting or as lively as this afternoon, but the motion sure is nice, with just enough breeze to ruffle your hair and for the most part, keep the sails full. 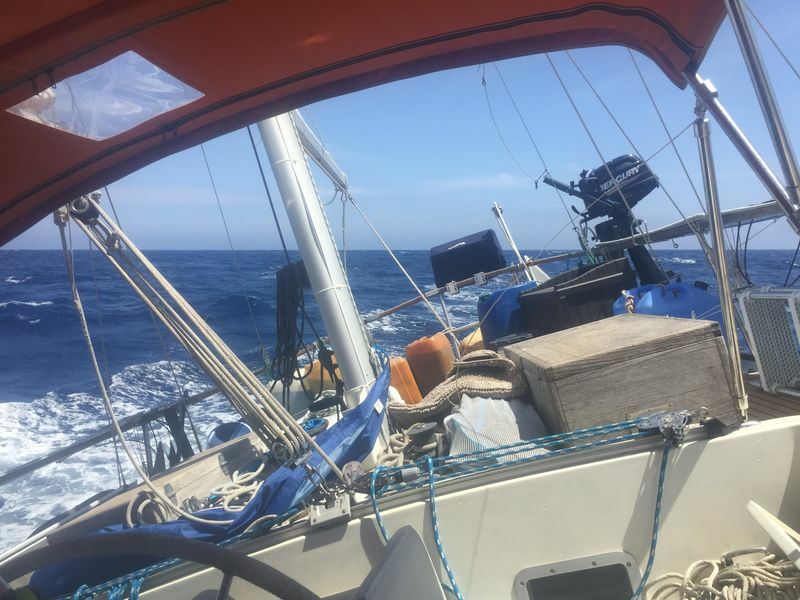 Fortunately the waves and swell have both dropped, the boat is swaying side to side less, the sails are not slating around and causing a ruckus. For now I will break our rule of three knots. It is just too nice of an evening to spoil it with the noisy, hot engine. 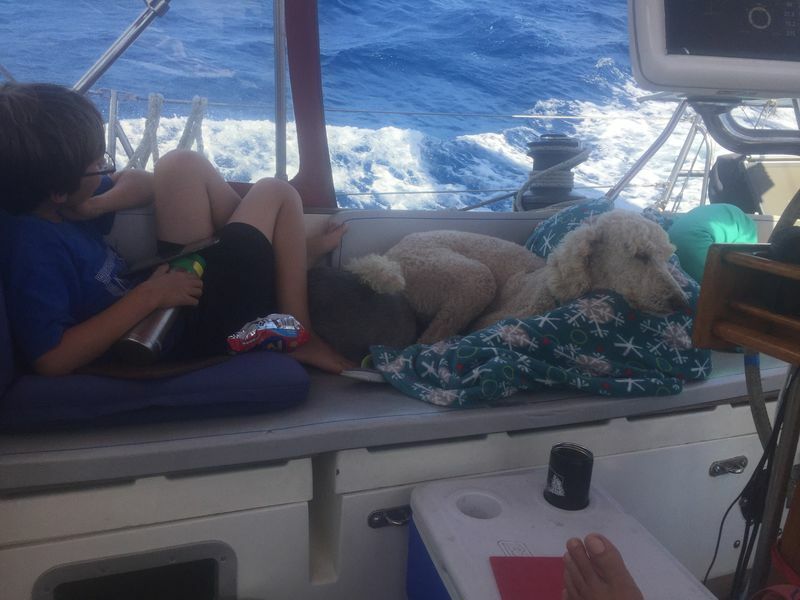 Just now the capricious winds picked up to over six knots, Mango perked up to three and a half knots, and not ten minutes later she settled back down to between two and two and a half. Now back to three, down to two point eight, etc.